How long has SPI been in business? 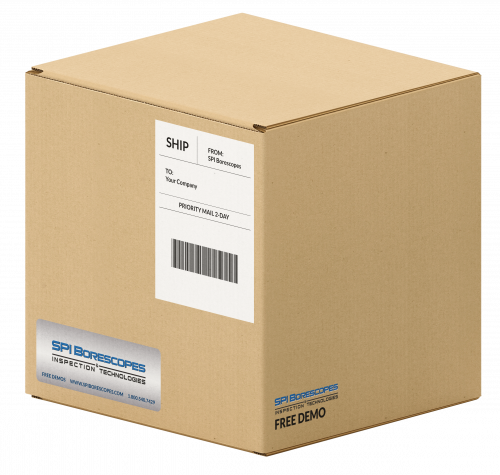 Our team has been involved in the Borescope industry for the better part of a decade, but SPI Borescopes was launched in February of 2013. How do I select the right borescope for my needs? You can easily do this through a 5-minute conversation with an SPI representative to discuss your inspection process and inspection needs. What do I do if I have a warranty or repair issue? You can simply call our main number on the website, or reach out to your sales representative. We will be able to address your needs and find the fastest resolution from that point. What Industries does SPI serve? You name it. Aviation, oil and gas, energy, automotive, armed forces, and more. We serve any and every industry where you need to get a good look in a place that won't fit your head. Our corporate headquarters is in Miami, FL; however, we also have an office in Michigan to strategically help our customers. How does the demo program work? We set up a call with an SPI representative for a 5-minute conversation to determine the best scope for you. The representative will then set up the best date and time to ship the unit to you. You will have 2-3 business days to test out our borescopes on your own inspections. After you’re done, just ship it back to SPI. Do I need to have a salesman come in for the demo? No. All of our demos are through the mail-out program. How much does the demo cost / Is it really FREE? There is absolutely no cost to demo or obligation to buy. How long can I keep the unit? Yours truly at SPI borescopes...IT’S FREE!!! No Catch!!! Can I buy a demo unit? Depending on inventory. Talk to your representative to see availability and pricing. Is there any obligation to buy? There isn’t one! No Catch. It’s a free demo program. We want you to try the scope, because we know you will love it! What is bending radius of articulating tip? Will it articulate a full 180 degrees? What is light intensity (how bright are the lights)? Is this scope intrinsically safe? No. Basically, no video borescopes are intrinsically safe because they have a camera and a light source that generates a small amount of electricity. What is resolution of videos and photos? 1 year manufacturer’s defect warranty. Typically 2-3 hours. Depends on use and inspection. Pictures and videos do affect the battery life. Yes, the probe and the camera tip have a IP67 rating. How do I get it repaired/what is repair cost? 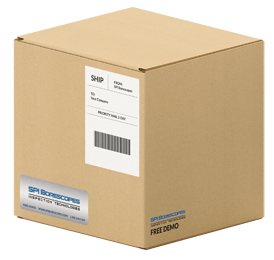 While repairs are extremely rare with SPI Borescopes, if you ever have a repair issue all you need to do is call the company number on the website or your sales representative, and we will troubleshoot the issue over the phone. If we are unable to solve it on the call you can send it back to SPI for a quick and cost effective repair. Do you have a loaner program while my unit is being repaired? How does the X1 compare to other borescopes on the market? This scope has superior articulation, camera resolution, and it takes videos & pictures. This product provides all the tools a professional will need. There’s a wide variety of borescopes in the remote visual inspection market. There are extremely high end borescopes that can cost between $30,000 - $50,0000 and then there are extremely low end borescopes that you can find in stores for $300. SPI Borescopes specializes in provides high quality borescopes that provide 95% of the usability of the extremely high end scopes, for a fraction of the scope. As we say, we provide twice the scope for half the price, and we are proud to have the best in class in regards to pricing and quality. What is the longest insertion tube you have for this scope? 3 meters or about 9 feet. Is there text capability to document pic/video on the scope? Not intrinsically, however, you can rename the files and photos on transfer. How do you clean this borescope? With mild detergent and water. What is the smallest diameter probe you have? Do you have guide tubes? Does it come in different lengths? How long can it be made? We can provide you with guide tubes at any length you need. Typically the guide tubes come in a length that matches the probe length. What is the safe operating temperature range? How do I decide the right length for my inspection? 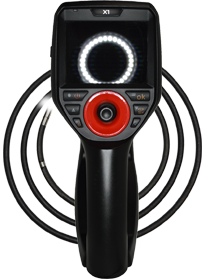 When it comes to finding the right length for you inspection, you want the borescope that will allow you to reach your needs and no longer. Shorter insertion tubes are easier to operate, articulate and provide less hazards for inspections. If you aren’t sure ask one of our representatives and they can go through the inspection process with you over the phone in order to help you determine the right scope for the job. Does this scope have measurement function? Does this scope have a 90 degree tip / or side view attachment? The 6mm probe has a side-view tip attachment, however the 3.8mm probe does not at this time. What is resolution of the camera? Approximately 4 hours. Depends on use and inspection. Pictures and videos do affect the battery life. How does it compare to other borescopes on the market? The MC1 Series of borescopes from SPI Borescopes has one of the best cameras on the market, strong light, and excellent 4-way 360 degree mechanical articulation at a price that cannot be beat. What is the longest length available for this scope? This scope has a 1.5 meter, 3.0 meter, and 6 meter probe. How does this scope compare with other scopes on the market? With strong lights, a 2 megapixel camera and mechanical articulation...this scope is made for a professional at a fraction of the price of the competition. Does this scope have a 90° / or side view attachment? The 6mm probe has a side view attachment tip, however the 4mm and 2.8 mm probe do not have a side view tip at this time. The JCM comes with a pipe camera that articulates 360 degrees in all directions, and a 2 way articulating attachable borescope. Will the borescope attachment articulate a full 180 degrees? No. 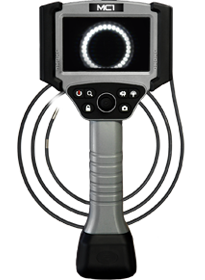 Basically, no borescope is intrinsically safe because they have a camera and a light source that generates a small amount of electricity. What is the camera resolution of photos and videos? Yes the pipe camera and the borescope are both, IP67 rated. 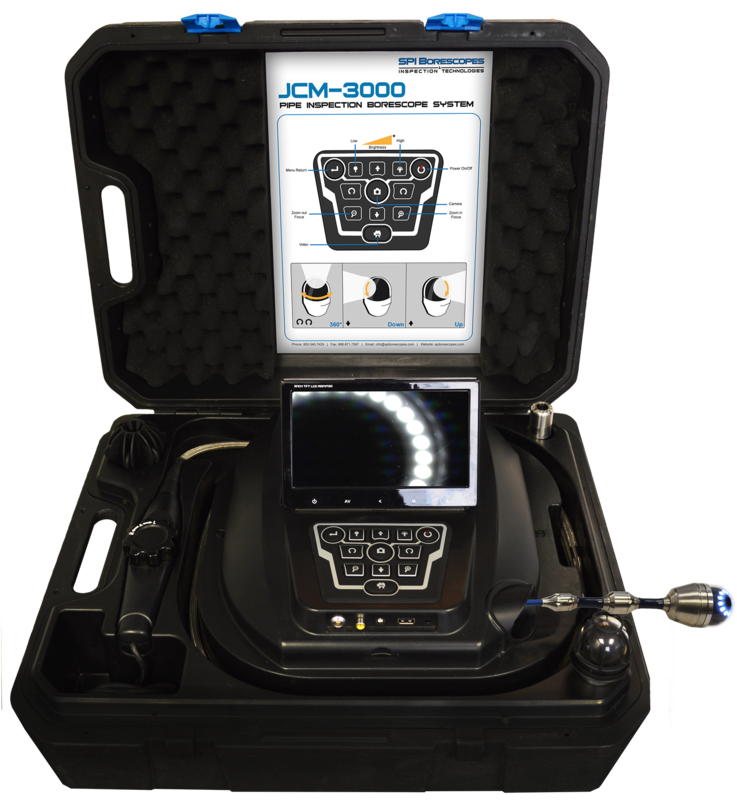 The JCM is the perfect combination of pipe camera and borescope for your everyday inspection needs. Most other products on the market force you to choose a pipe camera or a borescope. The JCM is 2 great tool in 1, helping you get the job done right the first time. What is the longest probe on the JCM? This pipe inspection system has a 5.5mm diameter. On the borescopes that are compatible with it the probe diameter is 8mm for both. We can provide you with guide tubes at any length you need for the borescope portion. Typically the guide tubes come in a length that matches the probe length. The DG1 has > 160 degree articulation. What is resolution of photos and videos? There’s a wide variety of borescopes in the market. 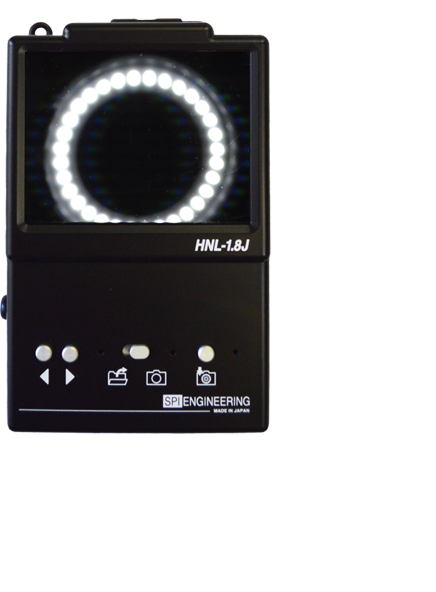 The DG1 provides 4 way articulation, a medical grade digital camera, and it takes pictures and videos. The DG1 delivers excellent value at an economical price. What is the longest probe length for this borescope? The maximum probe length is 3 meters. Our representatives can go through the inspection process with you over the phone in order to help you determine the right scope for the job. 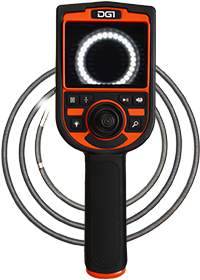 The DG1 is a perfect everyday scope for most Quality and Maintenance Engineers. It provides a clear camera quality, articulation, and pictures and videos in a very portable package. Does this scope have a 90* / or side view attachment? The 6mm probe has that attachment. Yes. This scope has an IP67 rating. The SPI Ultrathin 1.8mm borescope is the smallest borescope on the market. What is the longest probe length available? The longest probe for this scope is 2 meters. This scope offers the smallest probe diameter on the market at 1.8mm.